This weeks draw was held in Quinns and Mark Dunleavy of Killasser won €943. Envelopes are available in most business premises and online through www.swinfordgaa.ie where tickets can be purchased in bundles of 10/25/52 weeks. Next draw is in the Sheepwalk on the 13th September. Draw envelopes are now available at 3 for €5. Into the drum for the Grand draw on the 13th September go: Mark Dunleavy, MargaretCampbell, Killaturley, Callum Grufferty, Killasser, Mary Gallagher, Cloongullane, Martin O’Donoghue c/o MP Morans, Michelle Kennedy, Meelick, Boland Family, Bridge Street, Kathleen McNicholas, Gortnasillagh, Linda Campbell, Midfield, Ray O’Hara, Tullinacurra. There is still an opportunity to win an All Ireland Final Ticket. Ten more envelopes will be drawn out next week for the Grand draw will be held in the Sheepwalk on Tuesday 13th and the winner will take home an All Ireland Final Ticket. If you are not in you cannot win……..
After a dramatic draw a few weeks ago Swinford and Kilfian met again in the Junior Championship Relegation Playoff in Ballina at Sunday Lunchtime and Kilfian got the goals at the right time and retain their Junior status for next year on a final score of Swinford 1-9 Kilfian 3-10. 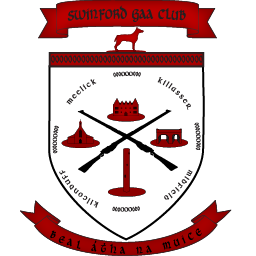 Swinford are now in last chance saloon in the coming weeks to retain Junior A status. We were treated to a very good game of Football at Robert McCallion Memorial Park in the opening game of the Under 15 League in which Hollymount Carramore came awey winners by one point on a score of Swinford 4-11 Hollymount Carramore 3-15. There are two very important Senior League games this coming weekend with the Division 1E team involved in a top of the table clash with Garrymore on Saturday evening and the Division 1C team have a very important game home to Achill on Sunday lunchtime.